"One of these things is not like the other one, one of these things just doesn't belong." Remember the old activity books from your childhood? One of my favorite activities as a kid was looking at two separate pictures and trying to distinguish the differences between them, like a hidden image or an item that somehow goes missing in the transition. I still do that from time to time these days, but in the form of the local Merit Industries trivia machine at the bar...I'm a little too old for comic books. Now Namco Bandai Games has such a product available for the Nintendo DS, QuickSpot. And it offers a little more value than you might expect. Like the activity books of yesteryear's past, players merely go through a series of puzzles, looking at an image on the top screen and a similar image on the bottom. They have to circle the differentiating graphics on the bottom screen, moving through a series of puzzles in a certain amount of time. 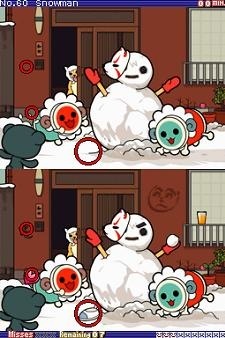 The earlier puzzles in the game can be mega-obvious, with huge characters standing around and little text balloons that weren't there before. 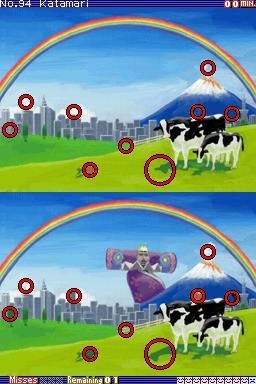 Later in the game, however, the challenges become much harder, with lesser images becoming harder to find. The game doesn't look and sound like anything marvelous. The soundtrack is made up of cute little MIDI tunes, including a couple of remixed nursery rhymes and even some slight Christmas melodies...odd. The sound effects simply consist of dings and blips, that's about it. As for visuals, a lot of the wallpapers look fascinating and draw from Namco's history, including the likes of the Prince of All Cosmos from Katamari Damacy and Klonoa. However, images have a tendency of repeating themselves over the course of the game. This turns out be a moderate disappointment, considering the simplicity of its nature and how much room Namco was left with to throw in extra wallpapers. The single player modes can be quite entertaining, but Namco Bandai tried to jump on the Brain Age train by throwing in evaluation screens after each set of puzzles. Unfortunately, these aren't very much in-depth, with a quick grid reading and little else. Bonus maps can be unlocked over the course of the game, adding to the small but noticeable replayability. The biggest feature, however, lies within the game's multiplayer factor. Several players can take part in a match in QuickSpot, beating their friends at finding the differences in things without the requirement of buying another cartridge (it fully supports game downloads to other systems). The Hot Potato game can be a riot as well, as players pass around the system until the screen "busts" a certain player in the group. For $20, QuickSpot offers pretty entertaining thrills, especially to kids or those looking to keep their eyes busy for awhile. The game lacks in genuine long-term appeal due to the repetitive settings and modes, but still has enough to make it worth a look. After all, you'd look kind of silly buying an activity book these days, wouldn't you? What's Hot: Surprisingly enjoyable multiplayer; a hearty number of puzzles to get through; $20. What's Not: Bland "Brain Age" elements; pictures tend to repeat; graphics and sound are plain.